Veenhuis has introduced the Nutri-Flow nutrient analysis system for its liquid applicators, allowing slurry and digestate to be used more accurately as a fertiliser. The basis behind the technology is Near Infra-Red Spectroscopy (NIRS) which is used to analyse slurry constituents N, P and K and dry matter levels. John Crooks of Veenhuis importer Technical Waste Solutions explains: “The system has been in development over many years in the Netherlands and extensive trials have been carried out to ensure that the calibration for all types of liquid manures is accurate. “Nutri-Flow is designed to make the most out of manure or digestate, by ensuring the end user can quantify exactly which nutrients have been placed on the field, rather than guessing on an unrepresentative sample from a few thousand tonnes. 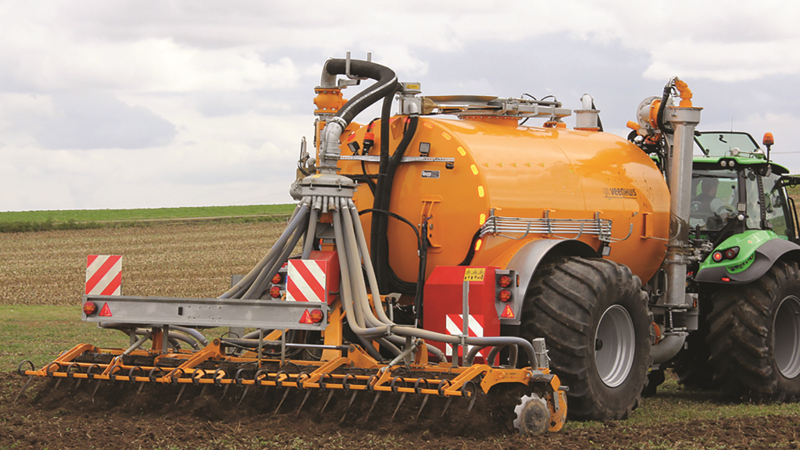 The unit can be used on any of the Veenhuis applicators, from umbilical to tanker, or as a stand-alone unit at an AD plant or digestate store. It can be retrofitted to older Veenhuis machines, and it is also possible to integrate it with other application equipment brands with appropriate software updates. Mr Crooks adds: “The Nutri-Flow unit is now being used extensively in the Netherlands. “In the UK, we have a number of customers who have made applications for grant funding under the Countryside Productivity Scheme for equipment to get more from slurry, as the system is one of the few which ticks all the boxes. Near Infra-Red (NIR) creates an invisible spectrum of the composition of a material. The NIR ‘eye’ in the Nutri-Flow unit translates the manure’s composition into a spectrum. This spectrum and laboratory references are used to create a calibration set giving a measurement for nitrogen, phosphate, potassium, ammonium and dry matter (N, P, K, NH4-N ammonium and DM%) in slurry or digestate and the data is recorded in real time as the material is applied. The Nutri-Flow system communicates with tractor or self-propelled applicator ISObus control systems, and the dose can be based on kg/ha of the selected nutrients using prescription maps uploaded via a USB, giving site specific application of organic fertiliser. 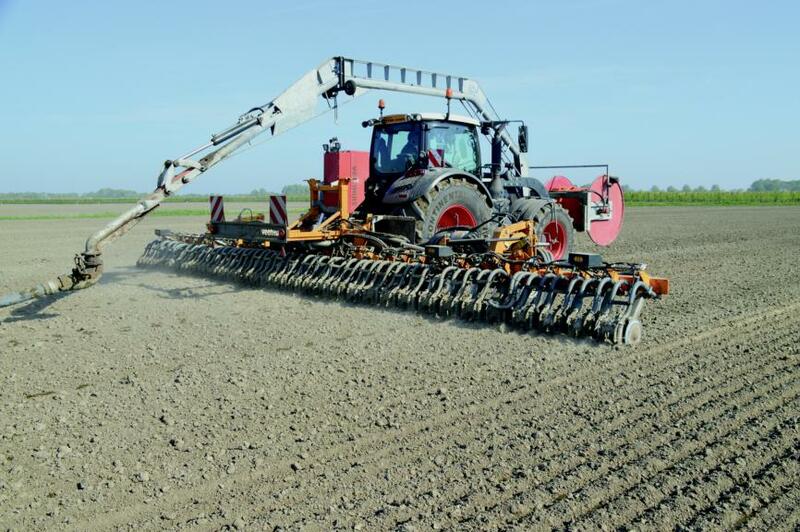 GPS-guided automatic section control is utilised on a dribble bar, trailing shoe or injector applicator to precisely apply the dose, without overlaps or misses in irregularly shaped fields. Digestate is a material governed by environmental legislation and requires a substantial amount of documentation when it is transported and deployed, thus there are benefits for the producer and transporter of the material as well as contractors and end users, suggests Veenhuis, including developing markets for a nutrient product of a known value. When the transport tanker is loaded at the AD plant, the location is logged along with the concentration of N, P, K and DM%, while the total weight and total N, P, K and DM% is added to the record when loading is complete. Analysis using Nutri-Flow can replace compulsory laboratory analysis otherwise required for transport. The haulage operation and unloading to a field applicator is tracked via GPS, and the location where the material is to be applied can be recorded and reported. This data can then be made available for traceability, licensing, and invoicing purposes. of a wider nutrient service, application data can be used to calculate the requirement for subsequent mineral fertiliser. Customers can adapt the dosage to their crop needs and ensure an accurate dosage of nutrients throughout the season. Veenhuis adds that there are also regulatory benefits, including the reduction of the administrative burden in recording digestate applications and minimising the risk of fraud.